The History of " Em Krützche "
As long as in 1989 "Em Krützche" could look back to 400 years hospitality and therewith celebrate its proud jubilee of 400 years history. 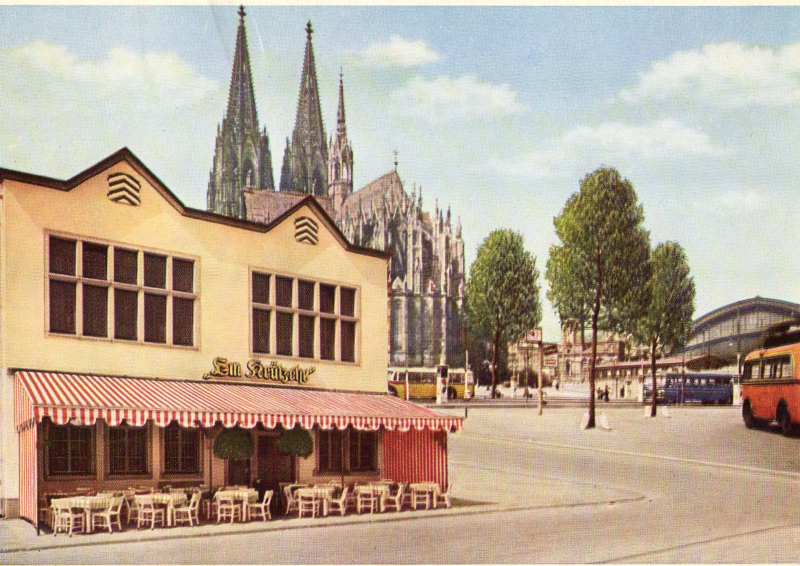 Although "Krützche" most probably could refer to a much longer tradition, if only the archieves of the city Cologne would have been worked up completely. Judging by the foundations of the "Em Krützche", this place of hospitality was probably created already during the end of the 12th century. Moreover, Hermann Weinsberg, mentions in his famous chronicle written in the 16th century a guest-house called " Red Swan" situated at the Frankenturm in connection with the 10th century. The eldest known document until now, mentioning the present house " Am Frankenturm 3 " was written down in the year 1589 and the name of the house " Zum Schwanen" most probably was based on the before mentioned chronicle. The present name " Krützche" owes to an old wayside shrine wich was -in earlier times - fixed up on the old city wall opposide of the house. 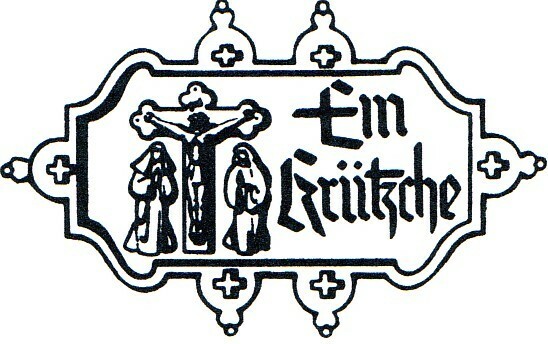 Up to the year 1910 there was a very special realitionship between clergy and "Em Krützche": an underground passage connected the cathedral "Dom" with the cellar of the guest-house. What was the reasonfor this tunnel? Could it be that the clergy was supplied by this discrete passage with the delicacies from kitchen and cellar of the "Krützche"? But most probably this underground passage served as a secret escape route for the Dom clergy in order to hide away in the crowded dock area when there was danger in delay.